Here’s to the middle of the road. With so many films out there, and so many new films being made every single day, not everything is going to be a game changer. Films that shake the firmament of filmmaking, whether due to financial success or high quality or some magical alchemy of both, are few and far between, and so are the truly, utterly deranged and misguided ones, the ones so bad, so out there they achieve a sort golden cult halo of beautiful mediocrity. In reality, most films are pretty much straight down the middle–too competent to be outre, too conventional to break the mold. Films that would never be anyone’s favorite. And this is ground that 1985’s claustrophobic contamination thriller WARNING SIGN occupies. This is not to say that being customary is inherently bad. Often times it can be–the worst thing a movie can be is boring, and the most boring tend to be the ones that take no chances, that live a humdrum, unadventurous, raptly bland existence. That said, it’s also not necessarily a demerit either–a good middle of the road movie may not blow your mind, but it will offer the warm-blanket comforts of formula done right, of an hour and a half or so of unadulterated, unpretentious entertainment. And this is also ground where WARNING SIGN dwells. Newly out on Blu-Ray from Scream Factory, WARNING SIGN is a barely remembered medical outbreak thriller that barely caused a blip at the box office, and seems to have vanished from most people’s memories, if they even saw it all. It was Sam Waterston’s first big film after getting Oscar-nominated for THE KILLING FIELDS and long before Law and Order turned him into a familiar TV face. It had a young Kathleen Quinlan and a young Jeffrey DeMunn (Dale from the first few seasons of The Walking Dead) and Yaphet Kotto a few years off from ALIEN. It was no doubt inspired by the wave of paranoid, anti-government nuclear catastrophe thrillers from THE CHINA SYNDROME to SILKWOOD that were big in the years prior. It’s a watered-down Romero riff; THE CRAZIES for normies. It’s mostly gone from public consciousness–just another casualty of indifferent audiences, the kind of box office stinker that can’t even muster up enough nerve to be a notable box office stinker. It was just another of the hundreds of forgotten films that come out each year, only to disappear into the abyss of the discount delete bin. It’s also a lot of perfectly professional, eminently watchable fun. Now, don’t get this reviewer wrong–Scream Factory hasn’t actually rediscovered some lost classic, putting it before our eyes to be reviewed anew, angling at a chance of joining the canon. This is likely a content filler for them. The film itself is more or less unremarkable as a piece of cultural detritus–the direction is functional and pedestrian, the acting solid but not amazing, the script businesslike. Any salient thematic points it makes are both superficial and ordinary. But there’s also nothing inherently wrong with the film either–director Hal Barwood keeps things moving. Waterston, DeMunn, and Quinlan (in a desperately underwritten role amidst a throng of stock roles) keep you sympathetic to their character’s plights. Nothing ever keeps you from necessarily looking away. This is the epitome of perfectly disposable, easily digestible comfort food formula. WARNING SIGN sometimes feels like a rudimentary precursor to both 28 DAYS LATER and the RESIDENT EVIL films as it both deals with a rage virus breaking loose as well as an outbreak of resurrective virus in a closed down, high tech medical facility. Yes, this film is, in its way, a zombie film. Outside a small Western town, an experimental agricultural firm has set up a top secret science lab dedicated to advancements in gene-splicing in order to prevent crop failure. Or that’s what they told the townspeople. 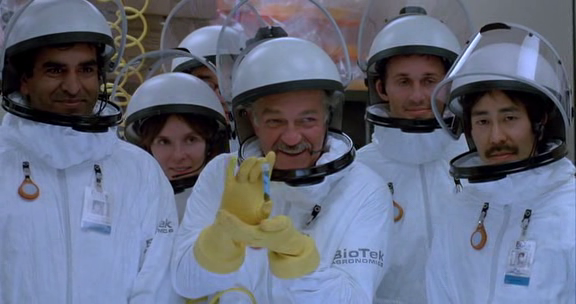 Deep in the bowels of the lab, the truth is revealed: the scientists are actually, in movie government fashion, working on secret germ warfare tests, weapons for future wars. We all know where this goes: someone will inevitably drop a vial and, despite all efforts to prevent spread of contamination, much of the cast will succumb to the virus, “dying” and resurrecting as vicious, mad and violence prone maniacs, swinging axes at those trapped who haven’t yet fallen prey to this insanity-inducing disease. WARNING SIGN is the schlocky B monster movie of all those post-Three Mile Island paranoid nuclear contamination fears, only here it’s a microbial disaster turning scientists into bug-eyed drooling rage creatures. As a horror film this is pretty tame fluff. Neither Barwood nor co-screenwriter Matthew Robbins (they previously worked on the Disney fantasy DRAGONSLAYER together, and Robbins would go on to work with Guillermo del Toro on the likes of MIMIC and CRIMSON PEAK) seem all that interested in genuinely scaring the audience, and there’s a sense that everyone involved no doubt thinks this is genuinely serious drama. It’s not; it’s a perfectly stock thriller with the overqualified cast playing perfectly stock characters–Waterston’s sheriff hero, DeMunn’s wise-cracking disgraced-scientist sidekick, Quinlan as the motivating love interest, and Kotto blustering around as the Official Government Prick angling to keep a lid on all this…at all costs, dun dun dun. For all it’s familiarity, though, WARNING SIGN feels comfortably standard, like an old sweater. There’s something almost cheery about kicking back and just relaxing with a tight, well-made, unchallenging little thriller. Compare this with another recent Scream Factory release, MAN’S BEST FRIEND. That film is also a fairly forgotten flop from yesteryear that isn’t concerned with rejuvenating the genre, but it also feels pat, like a dismissive trudge through genre mechanics rather than something anyone wanted to be part of. WARNING SIGN, at least, feels like it wants to deliver on its modest aims of entertaining anyone who sits down to watch scientists bludgeon each other to death while under the sway of murder germs. It may not be high art, but it is still watchable fluff. Hail to those that can drive down the middle of the road. WARNING SIGN is now available on Blu-ray from Scream Factory.